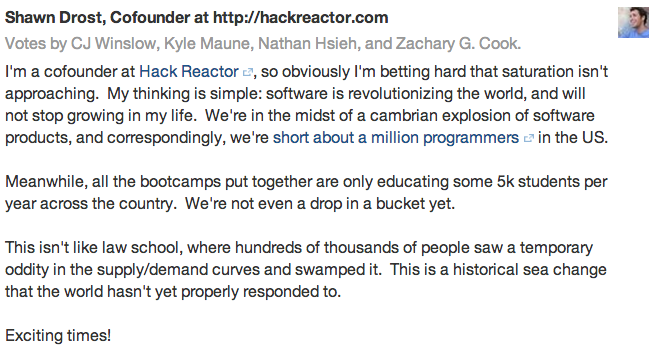 At Hack Reactor, we use Quora to directly respond to common questions posted by prospective coding school engineers. Our Quora page is basically a giant FAQ about our school and the coding bootcamp industry in general. If you're looking for a career in software engineering, read further for some valuable insight from HR co-founder Shawn Drost. Do Employers Care if You Graduate from a 'Bootcamp'? Hack Reactor prides itself on producing full-stack engineers and maintaining a 98% hiring rate, with an average salary in the six-figures. To see a list of companies that have hired Hack Reactor grads, scroll to the bottom of this page. What's in Hack Reactor's Program That Helps Grads Get Hired? Here's that link to what a bootcamp grad should do to find a job. Three points of emphasis are having a legit portfolio, a couple of professional contracts on your resume, and a compelling personal website. Your GitHub profile and amount of significant contributions is also very, very important. Are Coding Bootcamps Saturating the Job Market? It makes total sense to wonder about this, but honestly the data about the lack of engineers in this country should be quite reassuring. Also, if you look at salaries, which are related to supply and demand, they're going up for our grads not down. Here's more info about what the future of this job market looks like. Do you think coding bootcamps are a good way to fast-track your career into software engineering? Let us know on Twitter @HackReactor. Why Should Your Company Attend a Hack Reactor Hiring Event?